On a beautiful Friday afternoon, May 12 (1995) to be exact, I had the good fortune to spend some time talking with former astronaut Jim Buchli, who is currently the ISSA Utilization Manager for Boeing. 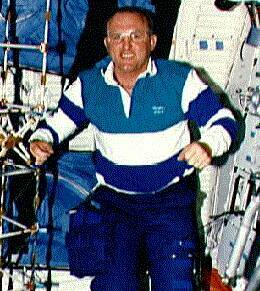 Mr Buchli had previously been selected as a NASA astronaut in 1978 as a member of Astronaut Class 8. He has logged more than 490 hours in space aboard STS missions 29, 48, 51-C, and 61-A. Mr. Buchli was also a Colonel with the United States Marine Corps. Also with us was Elliot Pulham, Public Relations Director for Boeing. Both men were in town at the invitation of the Planetary Studies Foundation. While here, Mr. Buchli gave six presentations on the space station program and his shuttle experiences to a total audience of approximately 2200 people. The groups ranged from the Fermi Lab Physics Colloquium to the grade schoolers at several area elementary schools. What follows is a transcript of the conversation we had while sitting on my patio, sipping Cokes, and enjoying the beautiful day. Plaxco: Jim, as the Utilization Manager for the Space Station program, what is your role? Buchli: Well, our main function is to make sure that the design of the station that is baselined meets the user community needs from a science standpoint. So we work with the requirements people on the vehicle side to make sure the flow-down of user needs meets the specifications as written and that the understanding of what is meant by the user needs is reflected in the design. Plaxco: This year things are really tight in the Federal Budget with a lot of competition for scarce dollars. In light of this, how would you go about justifying to Congress and the taxpayers the cost of the Space Station? Buchli: When you look at national projects which are investments in the future and in technology, you find very few that match in quality and return on the dollar anything like the Station. Let me give you an example. One of the things that we are going to try to do on the Station is microgravity combustion research. Look at all of the designs on the Earth that require heaters or furnaces or some way to heat with open flames. If you can imagine what just a two or three percent increase in efficiency would do in the way of saved dollars in that kind of technology and then relate that to the basic research that we are going to do on Station - because it is unique and flame propagation is so different without the effects of gravity there is a chance just in that field alone to recoup almost the full cost of the Station. In terms of medical research; if you look at the potential of what can be done in understanding tissue growth and then how it might be applied to research that is ground based and apply that to the cost of some of the medical problems we have today - like the many different kinds of cancers - there is a very large potential that the kinds of basic research you can do on Station has a very large payoff. I won't go so far as to say that we will solve the cancer problem or we will solve the problem of how to cure AIDS: I think that's foolish to make those claims but I think that if past history proves itself, those things that we have done on earlier projects in space ought to come across on Station many times better because its a much better on-orbit laboratory. Plaxco: Elliot, you're in the Public Relations Department, how would you answer that question? Pulham: Well Jim, that is something that we go around trying to answer a lot and I think one of the things that people have to understand is that the Space Station has a number of different things going for it, any one of which would make it well worth the investment. If you look on the science side, we're going to be able to perform science on the Space Station in all sorts of fields - in both basic and directed research - that really can't be performed anywhere else. That has a potential for accelerating the rate of discovery and invention by decades. The benefits of that on Earth are just impossible to calculate. You can look at the Space Station as breaking ground in a new kind of international cooperation. I know that a lot of people that support space like to think about things like Star Trek and look ahead to the Federation of Planets. I believe that this is laying the ground work for that. We've got 13 different nations besides the United States all cooperating on this in an unprecedented scale and learning how to work together for peaceful scientific reasons: that would make it worth the expenditure. If you look at the fact that space exploration has returned phenomenal benefits to this country in the past - almost by accident in terms of spinoffs - and now, rather than approaching space exploration in a way that we are going to maybe accidentally spin off some benefits, we are actually going after it in a directed way seeking these benefits. I think that makes it worth the investment. Look at what we are learning about manufacturing technologies to build the Space Station. We are using manufacturing technologies in ways that we haven't used them before. We are using materials in ways that haven't been done before. We are using welding processes that are incredible and that have never been used before. The benefit to the strength of the US manufacturing base and US business: that alone would probably justify the program. If you look at, as we saw today in the classrooms, the potential of a robust Space Station to inspire our children to study and improve themselves, and maybe help turn around the decline that we've seen in American education, that would justify the expenditure. Add all those things together and it is just phenomenal to me that anybody could say "Gee, we don't need that." Then consider what a tremendously small part of the Federal budget this is. You are talking about less than 7/10 of 1 percent - you're talking about 2 cents a day that it costs you as a taxpayer for this program. I can't think of anything that the Federal government does that is more beneficial and has more potential far-reaching impacts for us. I think that it is so many things in one that it is hard to describe all the benefits. Plaxco: In your mind, is there a single category of experiments that would benefit most from being done on the Space Station and most benefit the folks back here on Earth? Pulham: It's difficult to compare the types of science that go on. There are all sorts of branches of science and I don't think it really helps anybody to single one out and say that it is more important than another one is. I think that probably what people would relate to is the human health aspects of what we are going to be doing; like the research on how the astronauts who are up in space for long periods of time rapidly develop syndromes that are similar to aging sicknesses on Earth - like arthritis, osteoporosis and heart deterioration. Learning how to address those issues, as well as such health issues as custom design of pharmaceuticals through the protein crystal research that would go on - and which can only optimally be done on the Space Station; to develop especially designed drugs that can attack specific viruses without side effects and in a greatly accelerated time frame over the kind of development time frame we have on Earth. I think the human health issues are where there is a great potential for a lot of breakthroughs to come through. Plaxco: Jim, what is being done to make Space Station "researcher friendly?" Buchli: What we're trying to do, for one thing, is to make sure that all of the international racks are common so that we have commonalty through each of the modules. In the case of our Russian colleagues, they don't have the capability of taking on fully integrated racks so what we are going to do with them is make sure that all the sub-rack experiments, or as many as we can, have a sub-rack commonalty with common connectors, common data processing and common cooling requirements - the idea being that once you're on orbit, it won't matter which module you're located in. What matters is that that particular piece of the station services the researcher's needs adequately and properly and that the crewmen have a capability to interact, if necessary, with those payloads in an optimal manner. Plaxco: Is there going to be one central point of control for what experiments fly on the Station as a whole or will each country have control over the type of experiment that flies in its own lab module? Buchli: Currently, each country has control over their own priorities within the allocations that will be given to them. By that, I mean that you wouldn't expect a Japanese module to load up its five racks with high power users knowing full well it won't match what their allocations are going to be. Right now, the biggest thing is to look at what the limiting resources are going to be and do a mix and match within the reference frame of what are each of the nation's priorities and how does that apply to their allocations. One of the things that will be tough to do is planning crew time. You're going to have a mixed crew. You'll have Europeans, Russians, Japanese, and the US all together. The concept is to have one integrated crew. That will have to play well with what are the overall mission priorities on that increment and once you do that, you'll have to make sure that all of the different partners come to an agreement that all of these priorities are in sync and that everybody agrees that that's the case. Plaxco: One of the common criticisms of doing microgravity research aboard a manned facility is that you get a lot of vibrational noise and gravitational disturbances from all the movement going on. How much of a problem is this going to be aboard Space Station and are there any countermeasures that are being put in place to isolate the experiments? Buchli: Well, any time you have rotating machinery on a spacecraft it's going to cause vibro-acoustic interferences, so having a manned station versus one that's unmanned probably isn't that much of a difference. However, you also have a crew that can induce loads into an orbiting facility. What we are going to do with the racks that require a very high level of microgravity environment is to isolate them from the station with a thing called the Active Rack Isolation System. We are developing initially 15 of these systems that will be flown on 15 racks. If we need more, we can certainly go build more but this looks like it will probably meet our needs, at least initially. This system, since it is critical to provide that kind of environment, will be tested early-on on a SpaceHab flight with a rack integrated in the SpaceHab module so that we can see whether or not it really meets our requirements. So we are going to use early-on Shuttle flights in order to validate the design concept and then we are going to go off and build production hardware to meet the needs of not only the US Lab, but we are working with the partner labs so that we have the proper interfaces for these things in their facilities as well. Plaxco: Will these countermeasures be effective at the time of Shuttle dockings and reboosts or will something else have to be done? Buchli: No, during those periods of time you are in a mode that is really not a standard microgravity operational mode. What you're doing when you're getting resupply or you're getting a vehicle that is coming onboard is the crew is pretty much focused on that event - so the solar panels and the radiators will be feathered to minimize the amount of contamination that they might expect coming in and you'll probably not be doing any critical microgravity work at that time. Plaxco: Could you talk a little bit about the concept of using telescience in conjunction with Space Station experiments? Buchli: Sure, a good example of telescience might be a long term furnace melt where there really isn't much of a need for a crewman to be standing there at the rack monitoring specific temperature profiles; but there might be a need for a scientist on the ground, who is a materials science expert, to modify his procedures as he goes along. If that's the case, what we'll have is a communication link to the Station: through a relay satellite, through one of the control centers, and then out to that specific researcher's laboratory through a thing called a UOF (User Operations Facility). Those UOFs can be located in regional areas so that we get good communication links established to the local university net in that area. We haven't really worked out the details of that yet but the idea of having this kind of remote link and a protocol set up so that when you send up commands, they've all been verified and everybody knows where they are going and they know the extent to which those commands are going to get into the experiment - that will all be worked out and the idea is obviously that the researcher is most comfortable in his home laboratory so that he can take advantage of the type of science he wants to do at his home base, and work effectively remotely from that home location up to the Station. Plaxco: Given the amount of power that is available and the fact that there will be four crewmembers devoted to conducting experiments, approximately how many experiments can be conducted concurrently? Buchli: Really, it depends on what kind of power profiles each of those experiments are looking for. For example, if you've got a 12kW furnace that you're cranking up to full capacity, clearly that's going to be a really big draw on the amount of power that you can provide. What we really have to do is look at timelining those activities. What we would like to be able to do is provide a total of 26kW continuous power to the research community and then manage that power as a commodity or asset based on what the flight objectives are for each of the experiments and do a timelining process that allows us to maximize that particular commodity. You'll find times where perhaps power isn't the limiting factor perhaps cooling is a limiting factor; or data handling; or video; or crew time. All those things have to come in when you're trying to determine the mix and match on which payloads you want to run at what time and that's a process that our Payload Operations folks will handle to make sure that we are optimizing the operations on orbit. Plaxco: I've seen the figure that the annual average power available to user experiments is 43kW. What about over in the Russian half of the station, approximately how much power are they going to have available for experiments in their modules? Buchli: We're still negotiating that. You've got to be careful when you talk power. You've got to determine where that power is located. Are you talking about what's generated right at the solar panels or are you talking power what's available right at the rack interface? When you talk continuos power or average power numbers, what we really ought to be looking at is where is that power available: to what racks, during what part of the operations. For example, if I'm in a microgravity mode during a period of time when I have a very large Beta angle, I might find that I am power limited for my furnaces. However, I'm not power limited for life sciences research. So really when we talk about what is available to the user community, you've got to really understand that its a variable of the time of the year, the orbital characteristics, its a variable of the mode that the station is operating in, and it's a variable of how you want to shunt that power out to the different laboratories and then which channel each of the experimental racks is hooked up to. Plaxco: Could you describe what Beta angle is? Buchli: Beta angle is the angle between the incident of the Sun hitting on the solar panels. Typically, we like to look at powers available between zero and 52 degrees of Beta. However, there's about six times during the year where we get our Beta angle out to about 72 degrees and so we're looking at what operational activities we would do to mitigate those times when the power would be at a lower level either by yawing the vehicle and/or rolling it slightly so you get a better sun angle, but those things are strictly a geometry problem that occurs about six times every year. Plaxco: For the life sciences community, I believe that the Centrifuge Facility is the most important facility that is going to be on the Station. What is it's status and when is it going to be launched? Buchli: The Centrifuge Facility is part of Assembly Complete and I believe the last date I saw was for launch at the end of 2001. The Centrifuge is very important for those researchers who are going to do cell research - both plant and animal - and are also going to be doing small animal research. I'm not sure that from a life sciences standpoint - if I talk to someone who is doing research on a human research facility and using the CHeCS [Crew Health Care Subsystem] hardware, which is the crew health hardware - that they would agree with the statement that the centrifuge is the most important. I think it depends really on what aspects of life sciences you are interested in. If you're interested in those aspects of human performance in microgravity, then a centrifuge is not going to help you very much. If you're interested in those things that use tissue and cell growth, then the centrifuge is something that will be very, very useful. Plaxco: At this time, have any end user experiments been developed specifically for the station? Buchli: We have a lot of transition payloads that are in the pipeline. The science codes have not made their selection of what's being flown on any of the early utilization flights. We are working with them right now to establish what the baseline and accommodations are going to be during assembly and when we finish coming up with what I'm going to call an agreed-to baseline of accommodations, then they will start the manifesting process. So they have a good idea of what's out there, they just haven't made the selections yet. Plaxco: Regarding the US contribution to the station, approximately how much of the flight hardware has been built at this time? Pulham: Right now, for the US part of the hardware, we've got about 40,000 pounds on dock. Eventually, we will have between three and four hundred thousand pounds of US hardware. When you factor in the Russian hardware, the total station comes up to around 800,000 pounds. But we've completed about 40,0000 pounds of flight hardware and we're turning out more every day. Plaxco: Boeing recently signed its contract with NASA as prime contractor for $5.63 billion. How are the Boeing negotiations proceeding with your subcontractors? Pulham: Actually, they are going pretty well. We have an agreement with Rocketdyne and I think we are very close to an agreement with McDonnell Douglas. I'd say they are going very well. Plaxco: How much interaction does Boeing have directly with the International Partners and especially with Russia? Buchli: The interaction with Russia is primarily led by NASA. Those international agreements that are going to be made will go through a country to country protocol; through the Russian Space Agency and through NASA. But we've had technical interface meetings to discuss their hardware, and our hardware, and interfaces, and we have been involved, as has Lockheed, with Khrunichev in baselining and establishing the requirements for the FGB, which is a critical part of Russian hardware that we will be purchasing and therefore will become US property. So from a technical standpoint, we are very much engaged with them arm in arm with our NASA colleagues. Plaxco: What do you think would be the impact on the station program if Russia does decide to pull out? Buchli: There definitely would be an impact, there is no question about that. We are developing a plan that says if we would lose Russia's support in this project at different phases, what would be our options and that study is underway right now and it's coming along pretty well. The main impact would probably be dependent on what time that would occur and then how critical that would be to establishing and maintaining the schedule that we are already on. It's a difficult question to answer but we're looking at that and providing assessments to contingencies all along the way as to what would happen if any of the partners should decide not to participate. Plaxco: Would an early Russian cancellation require any reengineering of any existing station components? Plaxco: If Russia pulled out before any of the station hardware was launched, is there any chance that NASA would go back to the 24 degree orbit? Pulham: I would just add that this Russian question is more of a question among the people who are not on the program and have not worked with the Russians than it is among those of us who have been on the program and have worked with the Russians. Space Station is their number one priority for their space program. Their space program is their number priority as far as an opportunity to participate in the world economy and to continue to be a citizen of the world as they evolve their new government and their new identity as a nation. They are absolutely committed and they build good hardware and they are very good at it. Our experience in working with them is that when they have said they were going to get something to us, they did it; when they said they were going to build something, they built it; and they built good stuff. They're a little different for us to deal with because they don't engage in all the paper exercises that we do. They don't conduct a lot of paper reviews and they don't file a lot of drawings; they just focus on building their hardware. I don't think that if you asked anybody on the program "Are you really terribly concerned about the Russians?" that they would say "Yeah, we're worried about them." I think that everybody recognizes that you've got to be prepared for contingencies and they prepare for contingencies, but I think we expect the Russians to be very good partners. Plaxco: Are we buying the two Soyuz ACRVs from Russia or will that be a Russian contribution? Pulham: NASA is still negotiating that with the Russians and I'm not sure how that is going to come down. Plaxco: And what is the rationale for once Phase II is reached of reevaluating whether or not we would want to continue to use the Soyuz as the ACRV? Buchli: Well, I think it boils down to two things. One is what is the cost based on each one of those units when we sit down and look at the performance they give us. When it becomes time to look at Phase II and what our needs are, I'm not sure that we won't seriously consider continuing with the Soyuz and weigh that against the cost of developing a new piece of hardware and look at who wants to bid that project. So its really a business question that's coming along that says we already have baselined up through Phase II and when it comes time to look at what we have to do for the next part of the program, we'll take a look at all options. Plaxco: With respect to the Shuttle: aside from crew transfer and assembly flights, how will the Shuttle be used in the Space Station program? Buchli: It will also be a logistics carrier for us. One of the ways to exchange the ISPRs [International Standard Payload Rack], the large racks, is through a thing called the Mini Logistics Module [MPLM, provided by the Italian Space Agency] which will fly in the Shuttle bay. So we will use it for up-mass, for science, and to keep the Station functional, and any enhancements we want to make, as well as crew exchange; and then for those things that we need to bring back down, it will provide that support as well. The Shuttle provides the most benign way to get experimental data back down because it only pulls about 2 to 2.2 Gs - I think that's the number - whereas a ballistic reentry is anywhere from 6 to 8 Gs. Plaxco: At this time for the utilization flights, are there any plans to make use of either the SpaceHab or Spacelab modules? Buchli: No, there are not. Plaxco: When the orbit was changed from a 24 to 51 degree inclination, it was reported that the orbital debris environment at that inclination is about 15 percent worse. Did any reengineering have to be done to accommodate that? Pulham: I think we've learned some things in the last couple of years that give us greater confidence. We have had the benefit of a downlooking radar satellite study on the debris in the range that we intend to fly and we find that the debris problem in this range is considerably less severe than we had anticipated it to be. The other very hopeful indication we have has come from working with the Russians in the Phase I part of our activities. They have an awful lot of on-orbit experience and their experience also tends to tell us that debris is probably much less of a problem than we worry about - that we probably tend to design for a much more robust situation than really exists - so we're getting very confident that our debris situation is going to be very acceptable. Plaxco: One of the Shuttle missions is going to take a lot of close-up photographs of Mir to investigate orbital debris damage. If it turns out that Mir has more damage than expected, how will that information be used to assist the space station program? 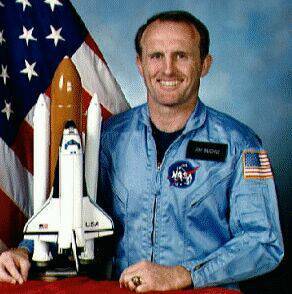 Pulham: In fact, that photography mission was performed on the rendezvous flight just recently [STS-63 in February 1995]. They found that the damage to Mir was very much as the Russians told us to expect it would be and that's very much in line with our models and our thinking of what the environment is going to be up there. So, that has been done and the results were very positive. Plaxco: Do you see the training for the assembly flights as being more intensive than for your average Shuttle flight? Buchli: I would say it depends on what we classify as an average Shuttle flight. If you look at what level of training took place for the Hubble repair, I would view that to be a pathfinder for the level of expertise that we may expect from our crewmen and I don't think that level of intensity is out of line at all for the types of things that we are going to be doing on Station. I believe that the Hubble repair was probably much more difficult than what we are going to ask our crewmembers to do during assembly. So I'm pretty comfortable with what we are going to ask the crew to train to do for the assembly - while it will be challenging, it is well within our operational experience base. Plaxco: So within the existing flight rate and the types of work you are going to have to do, it shouldn't place any undue demands on the astronaut corps or the existing training facilities or will there be additions or accommodations made? Buchli: Well, when you consider the planned additions that are already in the works, I think the answer to that is no. I think we're in pretty good shape. We know what we need with regard to water tank facilities - we're in the process of putting those in place. I think they've thought this out very well and are springboarding off the experience from Hubble which has given us a lot of very good data. Plaxco: Where will the station go at the end of its lifetime? Buchli: Well, we are looking at what kind of a strategy we are going to have in place for deorbiting the station, if that's what we decide to do, at the end of its lifetime. Plaxco: Elliot, what is the Achilles' heel of the program? Pulham: I think the Achilles' heel of the program, if we have one, is that it is a multigovernmental effort that requires continuos multiyear funding on the part of the many governments; that even though there are written commitments between these governments, governments and the people that are in them change and national priorities change; and the biggest threat to the program is that the consistent funding that is required would be interrupted due to some political event. That's where members of your organization are so terribly important to us because their voices, in the forms of calls and letters to their congressmen are terribly important to keeping the program support in the United States. So we hope that your members will do that.